4500 Thin & Zero Client Series expands ever-evolving 10ZiG Technology VDI endpoints with the highest levels of security at the best value and a rare fiber option; and IT professionals couldn’t be happier. Leicester, UK – 10ZiG Technology® is set to reveal its new, never-before-seen 4500 Thin & Zero Client Series endpoint at VMworld Las Vegas 2018 in just a few days. Offering the highest level of security in a value class, it includes a rare fiber option and will be available with PeakOS™ (Linux), Windows 10 IoT (W10 IoT), and NOS™ (Zero) for exceptional power, speed, performance, and security with VMware, Citrix, and Microsoft – supporting Blast Extreme, PCoIP, HDX, and RDP, among others. The new Client Series makes for very strong, efficient, and modern endpoint devices at attainable pricing, delivering IT professionals everything they need for safe, powerful deployments and performance. The growing industry trend in the importance of security also complements the timely 4500 endpoint introduction, which offers a rare fiber option for a much more secure network when compared to ethernet/copper cable. Providing dual screen support, both at 4K UHD resolutions, and a 1 x DisplayPort and 1 x HDMI combination, it is an ideal choice for central government and military, as well as industries such as finance and healthcare, requiring the absolute highest levels of security and support at an affordable price point. 10ZiG Technology is a world-market leader in Thin Client & Zero Client endpoint devices for Virtual Desktop Infrastructure. 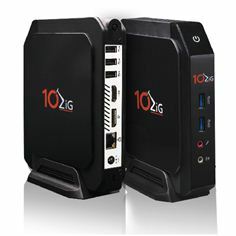 10ZiG provides leading Intel and AMD based Dual and Quad Core Thin Clients and Zero Clients for VMware Blast Extreme & PCoIP, Citrix (HDX, HDX Premium, HDX 3D Pro), and Microsoft environments, in addition to the widest range of Teradici PCoIP Zero Clients on the market. 10ZiG offers free, no-obligation demo devices, Technical Support teams based in the U.S. and Europe, and provides “The 10ZiG Manager” console with Cloud capabilities completely free with unlimited user licenses supported. Free evaluation devices are available at 10ZiG.com. To learn more about cutting-edge VDI technology from 10ZiG, or to arrange for a FREE Thin or Zero Client demonstration device, please contact 10ZiG below.